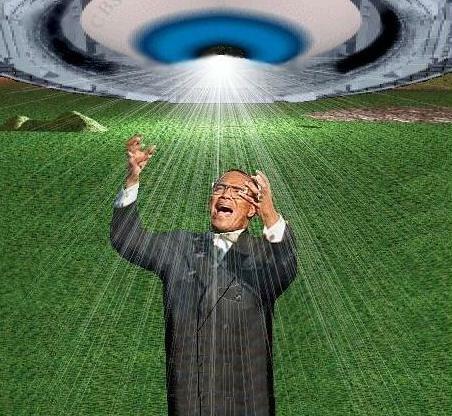 *Louis Farrakhan and the Nation of Islam have a foundation in the belief of aliens. They have long preached about those that are coming back to this world to show us the truth and bring back those who have gone on. They feel that the Master of their religion, Wallace D. Fard Muhammad, will be coming back because he is the one who gave the Truth [their religion] to Elijah Muhammad to share with the world. That is why we should follow god and not man. People elevating men to God status. Not just Ferry khan either, Pope, Obama, Oaf frah, Warren Buffett. Stop following Man and Follow God. jbfrom: Isn’t it time for you to go back to trolling at AOL and Netscape? Excuse me sir, trolling? AOL?? Netscape? What in the world. Surely you have me confused. Are you upset at my comment or something? I don’t need to troll. Mr. Ferry Khan is a troll himself. THIS IS AN OUTRIGHT LIE!! Neither Minister Farrakhan nor the Nation Of Islam have ever taught of aliens coming for anything. The NOI has always taught about human beings who operate what others refer to as UFO’s. The planes are no mystery to the NOI nor are they operated by aliens. Whoever posted this fictitious lie should be ostracized for displaying such blatant ignorance and do some basic research from the primary source, The Nation Of Islam! @iliarashad – I love the Hon. F as he speaks truth on many subjects but he said this with his own mouth check the video after the jump.